This article presents a spectrum sensing algorithm for wideband cognitive radio exploiting sensed spectrum discontinuity properties. Some work has already been investigated by wavelet approach by Giannakis et al., but in this article we investigate an algebraic framework in order to model spectrum discontinuities. The information derived at the level of these irregularities will be exploited in order to derive a spectrum sensing algorithm. The numerical simulation show satisfying results in terms of detection performance and receiver operating characteristics curves as the detector takes into account noise annihilation in its inner structure. During the last decades, we have witnessed a great progress and an increasing need for wireless communications systems due to costumers demand of more flexible, wireless, smaller, more intelligent, and practical devices explaining markets invaded by smart-phones, personal digital assistant (PDAs), tablets and netbooks. All this need for flexibility and more "mobile" devices lead to more and more needs to afford the spectral resources that shall be able to satisfy costumers need for mobility. But, as wide as spectrum seems to be, all those needs and demands made it a scarce resource and highly misused. Trying to face this shortage of radio resources, telecommunication regulators, and standardization organisms recommended sharing this valuable resource between the different actors in the wireless environment. The federal communications commission (FCC), for instance, defined a new policy of priorities in the wireless systems, giving some privileges to some users, called primary users (PU) and less to others, called secondary users (SU), who will use the spectrum in an opportunistic way with minimum interference to PU systems. Cognitive radio (CR) as introduced by Mitola , is one of those possible devices that could be deployed as SU equipments and systems in wireless networks. As originally defined, a CR is a self aware and "intelligent" device that can adapt itself to the Wireless environment changes. Such a device is able to detect the changes in wireless network to which it is connected and adapt its radio parameters to the new opportunities that are detected. This constant track of the environment change is called the "spectrum sensing" function of a CR device. Thus, spectrum sensing in CR aims in finding the holes in the PU transmission which are the best opportunities to be used by the SU. Many statistical approaches already exist. The easiest to implement and the reference detector in terms of complexity is still the energy detector (ED). Nevertheless, the ED is highly sensitive to noise and does not perform well in low signal to noise ratio (SNR). Other advanced techniques based on signals modulations and exploiting some of the transmitted signals inner properties were also developed. For instance, the detector that exploits the built-in cyclic properties on a given signal is the cyclostationary features detector (CFD). The CFD do have a great robustness to noise compared to ED but its high complexity is still a consequent draw back. Some other techniques, exploiting a wavelet approach to efficient spectrum sensing of wideband channels were also developed . The rest of the article is organized as following. In Section 2, we introduce the state of the art and the motivations behind our proposed approach. In Section 3, we state the problem as a detection problem with the formalism related to both sensing and detection theories. The derivation of the proposed technique and some key points on its implementation are introduced in Section 4. In Section 5, we give the results and the simulation framework in which the developed technique was simulated. Finally, Section 6 summarizes about the presented work and concludes about its contributions. Spectrum sensing: which is an important requirement towards CR implementation and feasibility. Three main strategies do exist in order to perform spectrum sensing: transmitter detection (involving PU detection techniques), cooperative detection (involving centralized and distributed schemes) and interference based detection. Spectrum management: which captures the most satisfying spectrum opportunities in order to meet both PU and SU quality of service (QoS). Spectrum mobility: which involves the mechanisms and protocols allowing frequency hopes and dynamic spectrum use. Spectrum sharing: which aims at providing a fair spectrum sharing strategy in order to serve the maximum number of SUs. The presented work fits in the context of spectrum sensing framework for CR networks (CRN) and more precisely single node detection or transmitter detection. In this context, many statistical approaches for spectrum sensing have been developed. The most performing one is the cyclostationary features detection technique [4, 5]. The main advantage of the cyclostationarity detection is that it can distinguish between noise signal and PU transmitted data. Indeed, noise has no spectral correlation whereas the modulated signals are usually cyclostationary with non null spectral correlation due to the embedded redundancy in the transmitted signal. The CFD is thus able to distinguish between noise and PU. The reference sensing method is the ED , as it is the easiest to implement. Although the ED can be implemented without any need of apriori knowledge of the PU signal, some difficulties still remain for implementation. First of all, the only PU signal that can be detected is the one having an energy above the threshold. So, the threshold selection in itself can be problematic as the threshold highly depends on the changing noise level and the interference level. Another challenging issue is that the energy detection approach cannot distinguish the PU from the other SU sharing the same channel. 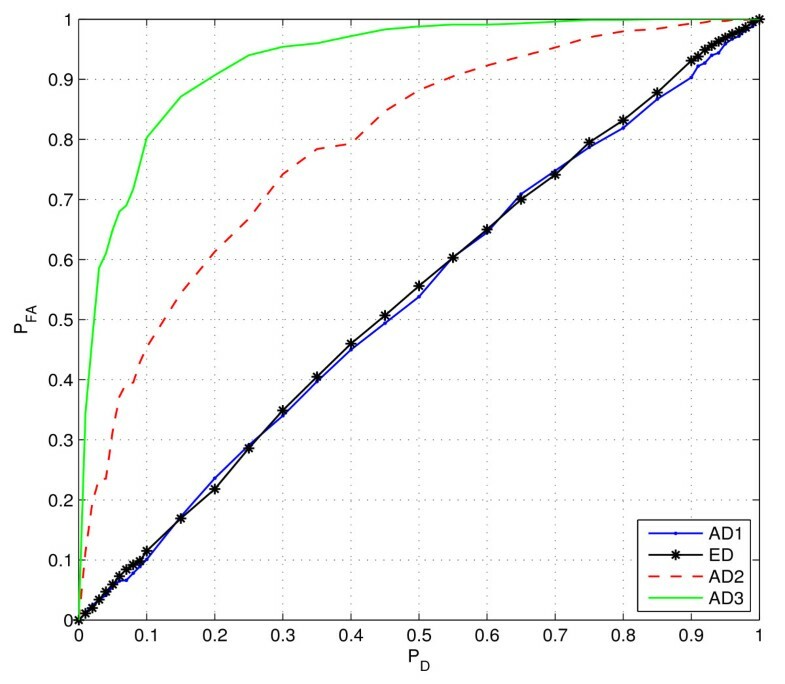 CFD is more robust to noise uncertainty than an ED. Furthermore, it can work with lower SNR than ED. More recently, a detector based on the signal space dimension based on the estimation of the number of the covariance matrix independent eigenvalues has been developed [6–8]. It was presented that one can conclude on the nature of this signal based on the number of the independent eigenvectors of the observed signal covariance matrix. The Akaike information criterion (AIC) was chosen in order to sense the signal presence over the spectrum bandwidth. By analyzing the number of significant eigenvalues minimizing the AIC, one is able to conclude on the nature of the sensed sub-band. Specifically, it is shown that the number of significant eigenvalues is related to the presence or not of data in the signal. Some other techniques, exploiting a wavelet approach to efficient spectrum sensing of wideband channels were also developed . The signal spectrum over a wide frequency band is decomposed into elementary building blocks of subbands that are well characterized by local irregularities in frequency. As a powerful mathematical tool for analyzing singularities and edges, the wavelet transform is employed to detect and estimate the local spectral irregular structure, which carries important information on the frequency locations and power spectral densities of the subbands. Along this line, a couple of wideband spectrum sensing techniques are developed based on the local maxima of the wavelet transform modulus and the multi-scale wavelet products. The proposed method was inspired from algebraic spike detection in electroencephalograms (EEGs)  and the recent work developed by Giannakis based on wavelet sensing . Originally, the algebraic detection technique was introduced [9, 10] to detect spike locations in EEGs. And thus it can be used to detect signals transients. Given Gi-annakis work on wavelet approach, and its limitations in complexity and implementation, we suggest in this context of wideband channels sensing, a detector using an algebraic approach to detect and estimate the local spectral irregular structure, which carries important information on the frequency locations and power spectral densities of the subbands. This article summarizes the work we've been conducting in spectrum sensing for CRN. A complete description of the reported work can be found in [11–15]. where A n being the transmission channel gain, s n is the transmit signal sent from primary user and e n is an additive corrupting noise. 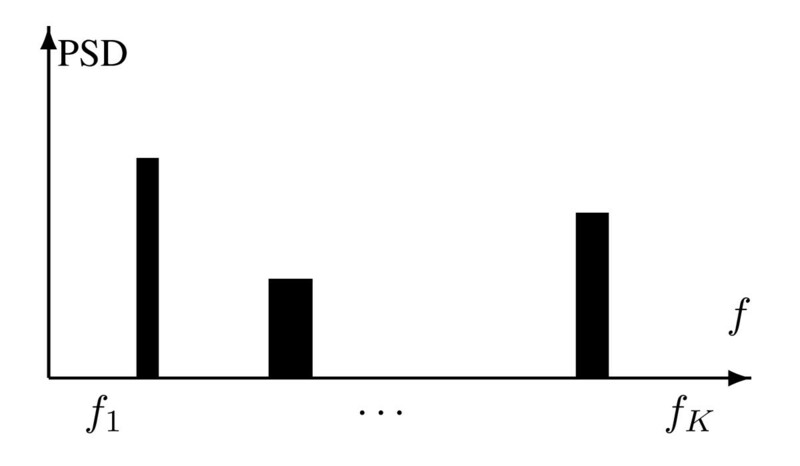 which represents the probability of the detector having detected a signal under hypothesis H1, where P M indicates the probability of missed detection. where F H 0 denote the cumulative distribution function (CDF) under H0. In this article, the threshold is determined for each of the detectors via a Monte Carlo simulation. The frequency boundaries f1 and f K = f1 + B are known to the CR. Even though the actual received signal may occupy a larger band, this CR regards [f1, f K ] as the wide band of interest and seeks white spaces only within this spectrum range. The number of bands N and the locations f2,..., fK-1are unknown to the CR. They remain unchanged within a time burst, but may vary from burst to burst in the presence of slow fading. The PSD within each band B n is smooth and almost flat, but exhibits discontinuities from its neighboring bands Bn-1and Bn+1. As such, irregularities in PSD appear at and only at the edges of the K bands. The corrupting noise is additive white and zero mean. K frequency bands with piecewise smooth PSD. where: χ i [fi-1, f i ]: the characteristic function of the interval [fi-1, f i ], (p i )i∈[1,K]: an N th order polynomials series, (f i )i∈[1,K]: the discontinuity points resulting from multiplying each p i by a χ i and n(f): the additive corrupting noise. And let b, the frequency band, given such as in each interval I b = [fi-1,fi] = [ν,ν + b], ν ≥ 0 maximally one change point occurs in the interval I b .
with μ k = 0⌋k = 1...Nif there is no change point and μ k ≠ 0⌋ k = 1...Nif the change point is in I b . [X ν (f)](N)is the regular derivative part of the N th derivative of the signal. Then, we process by detecting spectrum discontinuities and to find the intervals of interest. where N cd is the number of correct detections per iteration and N a is number of generated change points per iteration (it's the same in every iteration). where N F A | k ¯ is the average number of falsely detected change points given that the number of detected ones is k with n different realizations. where M is the number of samples of the received signal x n . Traditional ED can be simply implemented as a spectrum analyzer. A threshold used for PU detection is highly susceptible to unknown or changing noise levels. Even if the threshold would be set adaptively, presence of any in-band interference would confuse the ED. Since the complexity of sensing algorithms is a major concern in implementation. As ED is well known for its simplicity, the comparison is made with reference to it. Denoting M the number of samples of the received signal y n and N is the model order of the AD, we show that the AD complexity is NM and the ED complexity is M. From these results, we clearly see that the proposed sensing algorithm has a comparable complexity level as the ED. Table 1 summarizes the complexity of the two techniques. For simulation results, the choice of the DVB-T PU system is justified by the fact that most of the PU systems utilize the OFDM modulation format . The considered model is an additive white Gaussian noise (AWGN) channel. The simulation scenarios are generated by using different combinations of parameters given in Table 2. Figure 2 shows the detected change points by the algebraic technique where: the blue signal is the simulated OFDM signal and the green stars are the detected change points. Change point detection with SNR = -8 dB. 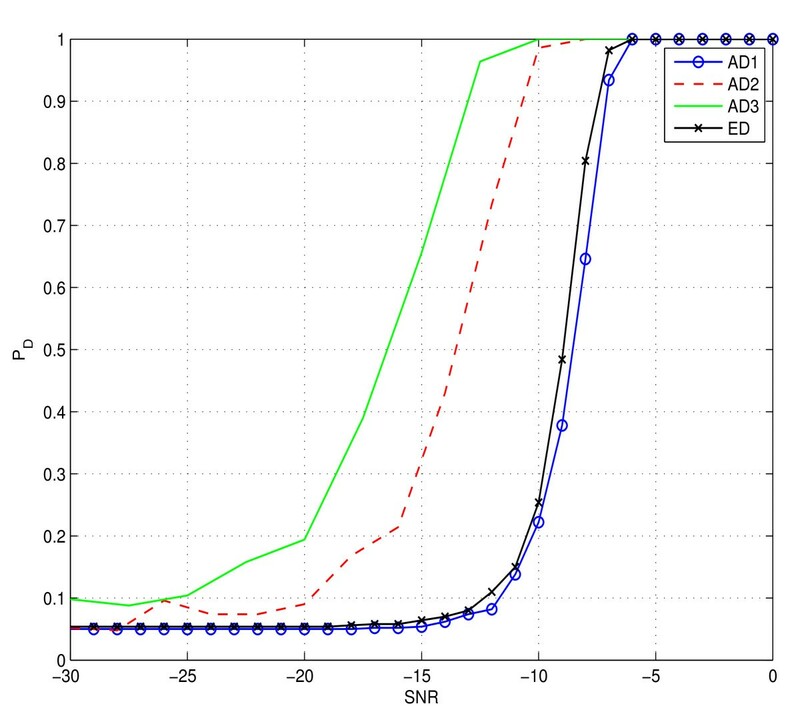 Figure 3 reports the comparison in terms of Probability of Detection versus SNR between the ED (ED) and the three first algebraic detectors:(AD1) (AD2) and (AD3), for P F = 0.05 and SNR ranging in -40 to 0 dBs. The threshold level for each detector is computed with function of the probability of false alarm P F with respect to (3.5). 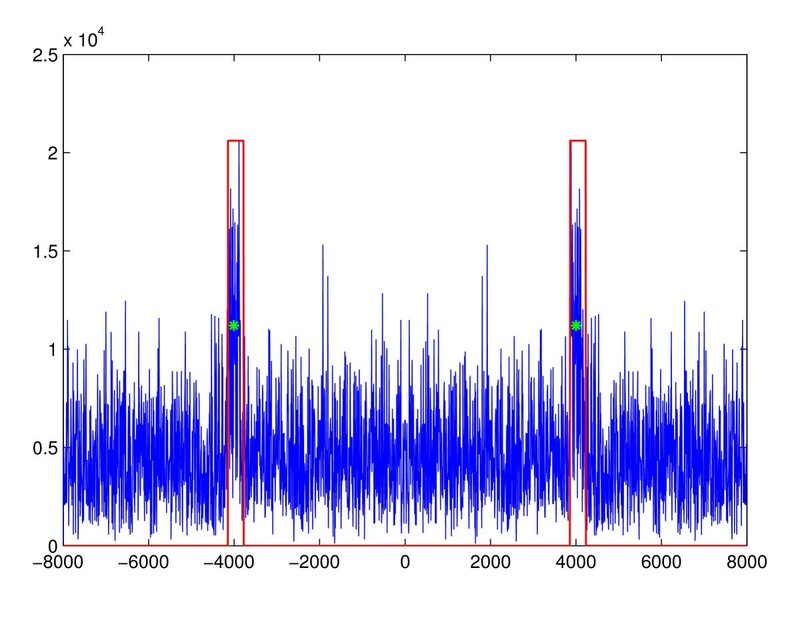 This figure clearly shows that the proposed sensing algorithm is quite robust to noise. These curves show also that the detection rate goes higher as the polynomial order gets higher. This result is to be expected as the higher the polynomial order is, the more accurate the approximation a polynomial is. Nevertheless, it is to be noticed that this gain in precision is implies a higher complexity in the algorithms implementation. Probability of detection vs. SNR for the simulated detectors with P F = 0.05. In Figure 4, we plot the ROC curve at an SNR = -15 dB. We clearly see that for the proposed technique, the higher the order, the more performing the detector gets. In this article, we presented a new standpoint for spectrum sensing emerging in detection theory, deriving from differential algebra, noncommutative ring theory, and operational calculus. The proposed algebraic based algorithm for spectrum sensing by change point detections in order to emphasizes "spike-like" parts of the given noisy amplitude spectrum. Simulations results showed that the proposed approach is very efficient to detect the occupied sub-bands in the the primary user transmissions. We have shown how very simple sensing algorithm with good robustness to noise can be devised within the framework of such unusual mathematical chapters in signal processing. A probabilistic interpretation, in the sense of ROC curve, probability of detection and probability of false alarm, is shown to be attached to the presented approach. It has allowed us to give a first step towards a more complete analysis of the proposed sensing algorithms. where, ( k N ) = N ! k ! ( N − k ) ! : : denotes the binomial coefficient. And the estimator is deduced by assuming as input the real amplitude spectrum Y(f) instead of X(f). The research work was carried out at EURECOM's Mobile Communications leading to these results has received funding from the European Community's Seventh Framework Programme (FP7/2007-2013) under grant agreement SACRA n◦249060.